Click on the book covers to buy directly from us here at Native Ground Books & Music! You can order a hard copy from Native Ground’s website or download a digital copy here at Log Cabin Cooking for selected titles. Hard copies also available at Indie Bound and Amazon. Let’s have a picnic! 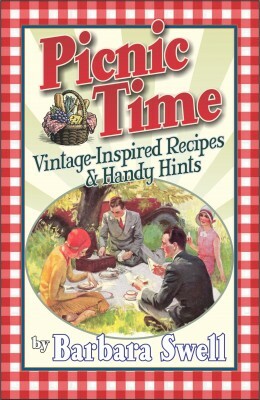 First, we’ll craft a picnic basket from vintage treasures and fill it with classic and creative picnic fare. Then we’re off to backyard, forest, roadside or campfire to enjoy festive sandwiches, garden slaws, fire roasted spreads, homemade raspberry marshmallows and more. Make a tin-can hobo stove, learn about roasting hot dogs on a nifty 1924 Model-T Ford exhaust manifold cooker and discover helpful hints to make your picnic special and easy! 5 1/2 x 8 1/2, 80 pages. Bake up your great grandmother’s wholesome, tasty hearth-baked breads in your own kitchen today! You’ll be amazed by the stunning loaves and rolls you pluck from new or vintage cast ironware, baking stones, or everyday gizmos that produce yesterday’s radiant cooking environments for your modern oven, wood fireplace, or campfire. Recipes from 1820 through 1920 include harvest apple bread, whole-grain little gem breads, oat sandwich loaf, buttermilk rolls, and lots more. Cookbook contains oodles of period photos and bread-lore and is appropriate for all skill levels. Peppered with authentic 19th century photographs, Log Cabin Cooking is smothered with old-time recipes, kitchen proverbs, even a pinch of proper pioneer etiquette! Make-do recipes include Leather Britches, Ash Cake and Portable Soup, using the ingredients available to settlers 150 years ago! Other goodies: hand-dipped candle making, soup warnings, molasses taffy, faux foods, zucchini clarinet and ginger beer! 5 ½ x 8 ½ , 64 pages. Mama’s in the Kitchen simply screams NOSTALGIA. Here are the stories and recipes of our mothers and grandmothers as they cooked their way through two world wars, food shortages, and the Great Depression. This lively and witty book chronicles how household gadgets dramatically changed the lives of women forever. It takes you into the kitchens of young housewives who whipped up cherry chiffon pies and weird little sandwiches to the beat of big band swing tunes playing on the radio. Lured by glossy product advertisements, these women were seduced into thinking that a green wiggly dessert would add glamour and romance to their lives. This book takes both a serious and a humorous look at women in a changing world. 5 ½ x 8 ½ , 72 pages. Come home to pie! This witty and fun book shows you how to make a darn good pie in a jiffy. You’ll feel like you’re back in your grandma’s kitchen as she shows you how she rolls out her flaky, tender pie crust. Recipes date from 1831, many from 19th century handwritten cooking journals. Includes old-time pie lore, pie insults, why men love pie, pie contest tips, vintage photos, historic recipes, and more. Make pies like Rum Bittersweet Chocolate, Vanilla crumb, Apple/Pear Mince, Sour Cherry Amaretto, Fresh Raspberry, Louisiana Peanut, as well as quick flip pies, dumplings and crisps. 5 ½ x 8 ½, 72 pages. Eat your way back in time and enter the world of American children as they lived 150 years ago. Sample foods, folklore and games found in the parlors of the wealthy, the boarding houses of the working class, and the cabins on the western frontier. Includes over 60 vintage photos plus historic recipes like cathead biscuits, sugar plums and hobo mulligan stew. Learn to make snow candles and snow taffy, tell Appalachian ghost stories and play roley hole and jack straws. 5 ½ x 8 ½ , 72 pages. Climb down off your tractor and dig into some old-fashioned, farm-fresh comfort food! We’ve got cranberry beef stew simmering on the old wood cookstove and some sweet corn just pulled off the stalks. Try a dab of this farm-churned golden butter on the orange rye bread still warm from the oven. Whether you’re a born farmer, or a country-minded city person, you’ll enjoy these creative rural American recipes from a time when the food was wholesome and life was full of fresh air and sunshine. These recipes, stores, jokes, advice, farm lore, and illustrations were collected from a wide variety of American agricultural sources from the 1880s to the 1950s. 5 ½ x 8 ½ , 72 pages. Reminisce about a simpler time as four 20th century mountain pioneer women share their cooking secrets. These great old-time cooks stir in their own wisdom and tales of growing up on rural farms, where they prepared delicious meals by lantern light on wood cookstoves. Included are heirloom recipes, proverbs, folk remedies, 80 vintage photos, 19th century autograph rhymes and lots of stories. 5 ½ x 8 ½ , 72 pages.